A lot of novice tarot readers are unaware that each card has an astrological correspondence and a reader can gain a lot more information from the card, beyond the pictures, by knowing the astrological significance and other ancient wisdom (such as the Qabalah / Kabbalah, numerology, I-Ching, etc.) that are the foundations of the cards. While the astrological correspondences (in the tables below) are based on Aleister Crowley’s Thoth Tarot Deck, I apply this to ALL Tarot cards as I read. Is Hobbyist a Dirty Word? 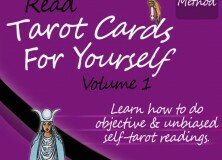 Are you are professional Tarot Reader or a Hobbyist?